The Prince’s Trust is proud to be working with the retail, leisure and hospitality sectors to create life-changing outcomes and employment opportunities for young people. Almost 10 million people currently work in the sectors, and this figure is expected to grow significantly. Our partnerships are highly impactful and working with employers and customers, we raise vital funds to transform the lives of young people. In 2016 the retail industry generated £358 billion worth of sales and is the largest private sector employer with 3.3 million employees in 2017 (Source: ONS, Eurostat, Retail Economics, Retail Appointment). Additionally, according to a recent survey by Deloitte, the UK’s leisure industry is now worth £117 billion, increasing nearly twice as fast as the retail industry. This increasing shift from consuming products to experiences has created a greater need for staffing to manage this growth (Source: Passion for leisure - A view of the UK leisure consumer report by Deloitte 2017). In short, these sectors are vital for the UK economy. In response to the current climate, our partners open their doors to young people, inspiring them about the opportunities a role in the sector could entail. From developing skills in customer service and merchandising to cooking and even working on a cruise ship, together we equip vulnerable young people with the skills, experience and confidence they need to find a job. Our sector-leading employability programmes give young people the chance to get into work through hands-on practical training. Through our partnerships, we have supported 825,000 young people over the last 40 years. Our vision is to now help one million young people over the next 10 years. Right now there are hundreds of thousands of young people who are facing the most unimaginable barriers to succeed and desperately need our help. As a sector we can offer vulnerable young people the life-changing opportunity to develop their skills so they can change their future. It is crucial that we empower young people, regardless of their background, to thrive in roles across the industry. 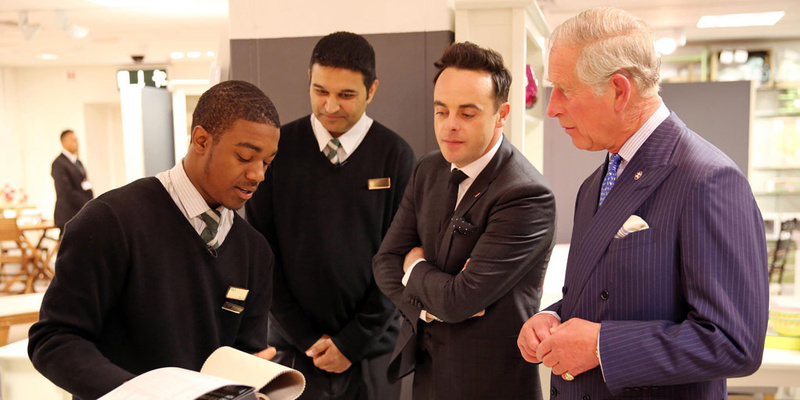 Marks & Spencer help over 1,400 young people every year through a tailored employability programme with The Prince's Trust. Over the past three years, one of our largest Get into delivery partners, TK Maxx, have supported us to develop young people's skills and helping them to secure roles in the retail sector. Equipping young people with the confidence to re-engage with education, HomeSense has been supporting us to develop our Achieve programme. The retail brands are our headline sponsors for Prince's Trust Awards. In February 2017, The Prince’s Trust and L’Oréal Paris launched a multi-year collaboration and ‘All Worth It’ confidence programme to help 10,000 young people across the UK turn their self-doubt into self-worth. The partnership is fronted by 15 celebrities and inspirational ambassadors including Dame Helen Mirren, Cheryl and Katie Piper. ASOS is the UK's largest online fashion retailer and has been a partner of the Trust since 2010, to inspire over 470 young people into the world of fashion, retail and digital technology. The skills-based programmes they run with The Trust, help young people gain confidence and the opportunity to learn more about the retail industry. Fundraising at sea and on land, Cunard Line crew and guests go above and beyond to raise funds to change young lives. Having already raised £1 million for us, we are working together to raise a further £1 million by 2018. Cunard Line host special events, create bespoke products and take part in a variety of fundraising challenges. From cycling across the UK to hosting gala dinners, Marriott’s employees’ enthusiasm is the fuel of this multi-year partnership. Marriott customers also play a central role in our partnership, supporting us through donations on their bills and with selected menu items at their restaurants. As a key delivery partner of our Get into employability programme, Marriott has supported many young people into careers in the sector. In 2018 ŠKODA UK launched the Driver’s Seat Initiative and in partnership with The Prince’s Trust is giving more than 50 young people the opportunity and platform to learn new skills and explore their creativity. Together we hope to make a real impact on young people’s lives and their communities.